Railroad transport company CSX Transportation has long occupied one of downtown Jacksonville’s most distinctive highrises, and conducts its most critical business—such as informing investment portfolio and fund managers of its quarterly earnings and media outreach—from executive suites and meeting rooms on the 15th floor. This floor, including the executive boardroom, committee meeting room, and vestibule/lounge area, was fully renovated by Gresham, Smith & Partners. 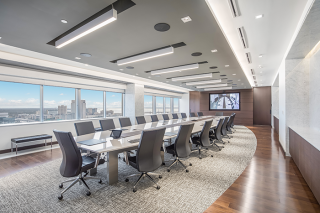 To ensure an optimal, ergonomic video conferencing and meeting experience, this architectural firm brought Midtown Video, a Miami-based AV systems integration company, into the project to install customized videoconferencing and meeting control systems. While waiting for meetings to begin, attendees pass the time in the vestibule/lobby area, where they can watch TV—including satellite TV channels, DVDs, and/or Apple TV—on two Panasonic 55-inch displays, and eat food served in the nearby kitchen. When no video program is selected, Apple TV shows beauty shots as screen savers. For private meetings and negotiations, the adjacent committee room accommodates eight people, and features a Lifesize Icon 600 videoconferencing system, three Panasonic 55-inch displays, and Crestron AV systems control. The executive boardroom features a massive conference table—designed and built by Antique and Modern Cabinets of Jacksonville—that seats 21 people, and two Panasonic 98-inch 4K/UHD wall-mounted displays. Powering the room are a Crestron 3-Series 4K Digital Media Presentation System 300, Lifesize Icon 800 Video/Audio conferencing system, and two Lifesize camera 10X systems that provide different perspectives of the room. AV equipment, such as a Crestron 8x8 digital media switcher, is stored in racks in the nearby IT closet. Crestron 10.1- and 8.7-inch wired and wireless touchscreens enable meeting hosts to remotely control the sound, lights, and window shades. With custom programming and graphics, the control panels allow users to select media sources for display, like satellite TV, DVD players, and Apple TV, as well as multiple PCs, laptops, and mobile devices. In the boardroom, an equipment trough runs the length of the conference table, so control equipment can be hidden away, including mobile device charging stations and table boxes for plugging in computer devices. While VGA with audio, HDMI, USB, Ethernet, and AC power connections are supported, a Barco ClickShare system allows people to plug a device into their USB that allows them to direct their screen output to the room’s displays, and switch between computers with ease. At the heart of each room is a Crestron Avia 12x8 DSP with Dante audio/IP networking, USB audio, AEC and audio conferencing interface, and a Crestron eight-channel (75W per channel) power amplifier. “The most complex part of this installation was the digital signal processing (DSP) associated with the audio system,” VanOrmer said. “Due to the large size of the conference table and room, we used the Crestron DSP and mix-minus processing to independently process each mic, and amplify the voices at each end of the table, so that all voices could be heard at the same volume,” VanOrmer said. “We programmed the DSP using the acoustic echo cancellation feature to eliminate feedback and echo caused by audio picked up by the room mics.